Nusret Gökçe, the Turkish restaurant owner dubbed "Salt Bae" by fans, including Rihanna, says he plans to open restaurants in New York and London. Gökçe blew up online after footage of him carving meat and flamboyantly sprinkling salt on top went viral earlier this month. Away from the internet the chef is a co-partner of the global Nusr-et chain of grill houses. He spoke to Turkey's Hürriyet Daily News and informed them of his plans for the future, saying that restaurants in the U.S. and U.K. were next on the agenda for his company. Gökçe did qualify that he doesn't speak any foreign languages but that he is able to "communicate with people through meat." Elsewhere in the interview Gökçe provided some background on his life. He said he became a butcher at 14 when his parents could not afford to send him to school and explained where his signature sprinkling technique comes from. "That move at the end [salting] came automatically," he said. "I did not do that to show off. It is just my signature. You can think of it a kind of final touch for a painting. It was a final touch to the meat; I was blessing the meat." 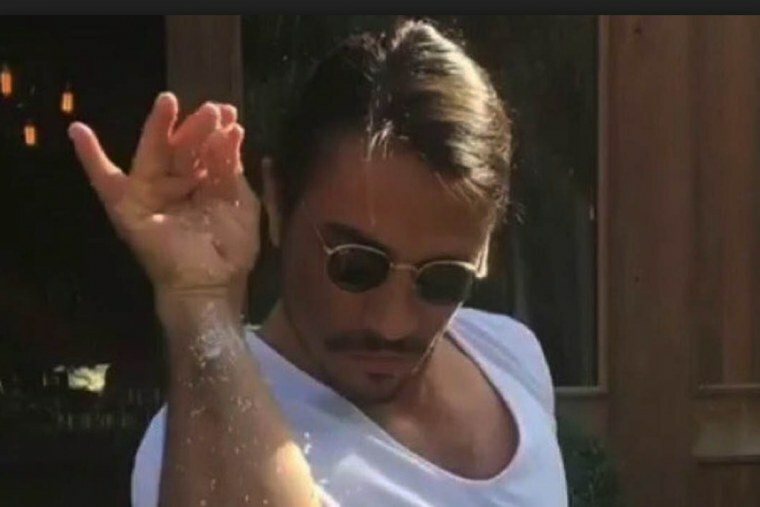 Check out Salt Bae's signature butchery skills below.